Children under the age of 18 are only allowed accompanied by adult supervisors. Destiny Student - Shrubhill is located just off Leith Walk close to Waverly Train Station, the Edinburgh Playhouse or the St. James Shopping Centre, this purpose-built student campus accommodation offers guests a central and affordable base in Edinburgh. 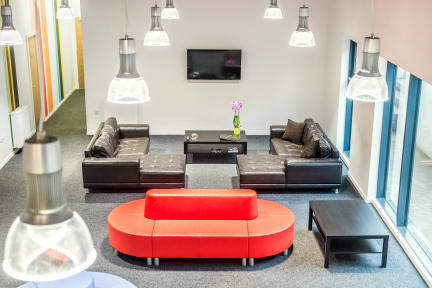 Our modern designed common areas such as games room and lounge area offer a great space to socialise or join in for one of our various events. 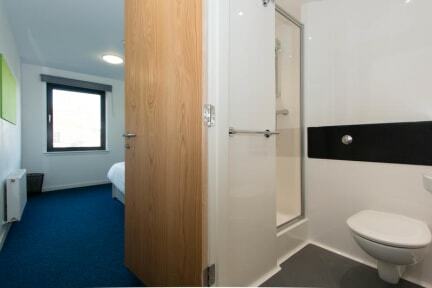 Destiny Student - Shrubhill offers double en-suite rooms with shared kitchen and living areas. Private apartments are available for larger groups or families. Studios with en-suite facilities, and private kitchen and living areas are also available. At Shrubhill we offer you a 24 hour reception just as well as a tour desk where you can book your pub crawl, walking tour or bus tour into the Highlands. There are lots of independent cafes and restaurants in the area and even a supermarket in the same building. The bus stop opposite the accommodation offers you a bus connection into the Old Town or you could choose to walk there in just 15 minutes. Great location, good for price. Really good hostel, it was clean and the staff was ok. The furniture isn't that beautiful, but for the price it's good! Clean, quiet, with helpful kitchen facilities and common room TV. The bed, however, was awful, making it difficult to sleep. Lopsided mattress, with protruding springs. Couples might opt for single beds or a suite. This place is fine. It's a dorm during the school year and they rent it out as a hostel during the summer. It doesn't feel particularly social and is a bit pricey for what it is but it's fine. Very noisey room at front of the building allocated to me but staff were helpful and moved me to another room however very loud building site at rear of block. Room was tiny and extremely stuffy. Very expensive for what you get.